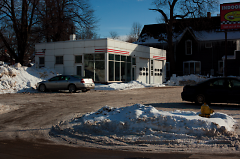 Owner Bob Graham has purchased the dilapidated auto garage on Wealthy Street in East Hills with the intent to renovate and relocate the current operation. 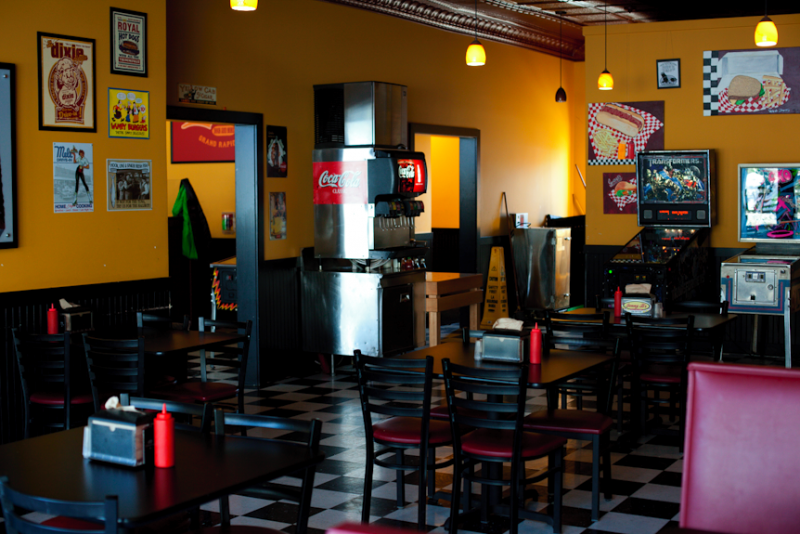 Jonny B'z Dogs and More known for its grilled beef franks and free pinball is in the planning stages of making their move to a new but very proximal location. 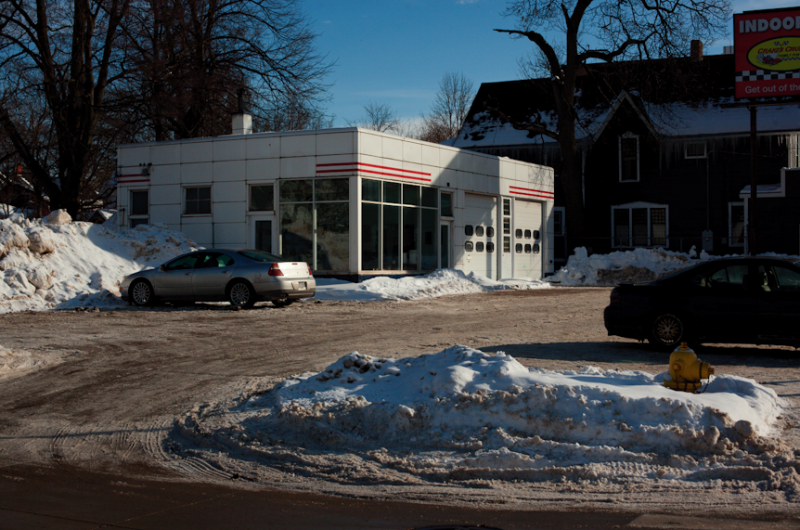 On the corner of Wealthy and Henry sits an old gas station in disrepair. The building was purchased by Bob Graham, proprietor of Jonny B'z with the intent to append the west flank, repair the roof and restore the interior and facade to accommodate a kitchen and dining space. Some of the challenges in preserving the original look involve insulating the walls and reducing the acoustics of a space comprised of lots of hard surfaces. In order to meet the Americans with Disabilities Act, the bathrooms will need to be rotated 90 degrees. 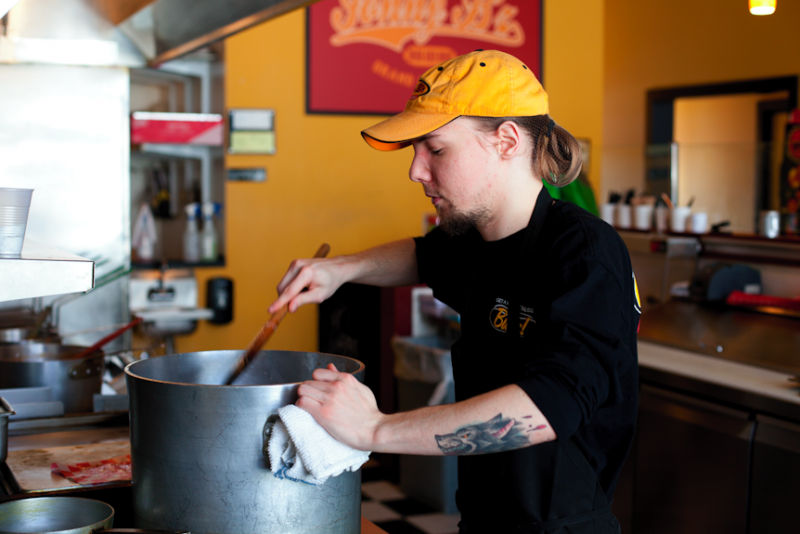 Jonny B'z joins a handful of other repurposed gas stations to restaurants in the neighborhood including Wealthy Street Station, the old Sandmann's and Donkey Taqueria which sits just across the street. Turning a vacant building into an active venue can add life to a neighborhood. "We want to conserve the building. We don't want to mar the building in any way. We want to get the addition on it that looks appropriate. We want to maintain parking in the lot," says Graham. "It's a building that's been under utilized for a long time. Seeing a vibrant business flow-seeing the community come in and out of there- as they visit Jonny B'z is significant. Like all buildings, it needs attention." Graham is interested in hearing concerns and ideas from the local community. He has presented his plans to the Historic Preservation Committee and East Hills Council of Neighbors in order to glean feedback about the direction in which he envisions. "We wanted to show them what we were thinking and get their feedback on what they would like to see. We got a lot of input from East Hills Council of Neighbors. We're trying to incorporate into the plan some of the things they would like to see," says Graham. "Sometimes what one group or person would like to see is in direct conflict with another group. We're trying to make it workable- make it a place that is aesthetically pleasing- and something that would be functional in the community and larger neighborhood." 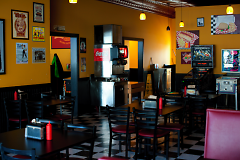 The decision to move to 710 Wealthy was based on a need for expansion, primarily by providing the space for a larger grill and rotissery style smoker. Jonny B'z smokes their own brisket, bacon and pastrami. "We're smoking more and more meats. We have a 160 pound smoker now and we want to go to a 400 pound smoker," says Graham. "We don't have any plans to change. The menu is going to be the same. Our goal is to be able to serve it up a little quicker." Jonny B'z opened in May of 2010 at 638 Wealthy Street and has a diverse customer base including young professionals, hospital and construction workers during the day and families in the early evening or folks grabbing take out on their way home from work. Many patrons are neighbors, and in the evening there tends to be a large bar crowd. The cross section of customers is as varied as the neighborhood. If all the zoning approvals and building requirements are met in a timely fashion, Graham would like to see the building occupied and operational by next fall.